If you're a cat lover who suffers from allergies, you will be happy to hear that some cats are hypoallergenic. Since cat allergies are caused by a reaction to a specific protein in kitty saliva, it is impossible to have a cat breed with 0% allergens. However, many allergic people are able to tolerate the lower levels of allergens in hypoallergenic cats. What types of cats are best for people with cat allergies? Here are 6 hypoallergenic cat breeds you should know about. At first glance, most people would never guess that the Siberian cat would be a good choice for allergy-prone people. Its luxurious, long, white coat reminds one of a small teddy bear. According to breeders, this cat breed produces lower levels of the allergy-causing protein Fel D1. Some people even claim that 75% of allergy sufferers can tolerate Siberian cats with no reaction. Because they still produce dander and saliva, Cornish Rex cats are not considered "true" hypoallergenic cats. But they do shed significantly less fur than other breeds. Their short coats are made up of tiny waves in a "washboard" pattern. To keep allergens at bay and reduce oil buildup, their owners have to bathe them regularly. Even with its long, silky coat, the Balinese cat breed sheds very little fur. These cats are elegant, polite, and very graceful. In addition, they produce much less of the Fel D1 protein than average cats. This makes them the perfect choice for allergy sufferers. With their short, curly hair, Devonshire Rex cats produce less allergens than an average cat breed. The good news is that they don't need regular full baths like the Cornish Rex. Instead, keeping her paw pads and ears clean will be sufficient. These cats are highly intelligent and active, so they need lots of interaction and playtime. Shopping for an affordable cat house? Get free shipping at UnderCover Pet Houses! Because this hypoallergenic cat breed has short hair, it produces less allergens than comparable breeds. Oriental shorthairs can have one of 300+ colours and patterns. This allows for a broad palette of colours within the breed. This cat breed is vocal, very affectionate, and highly intelligent. As a relative of the Siamese cat breed, Javanese kitties have large blue eyes, big ears, and a wedge-shaped head. Because they don't have an undercoat, their coat produces less allergens than a typical coat. They also need less brushing than other cats. With their affectionate personalities, they are perfect for first-time cat owners. Which of these hypoallergenic cats would you choose if you were allergic to cats? Comment below to share your answer! Looking for an outside cat house? Find the perfect one at www.undercoverpethouses.com! 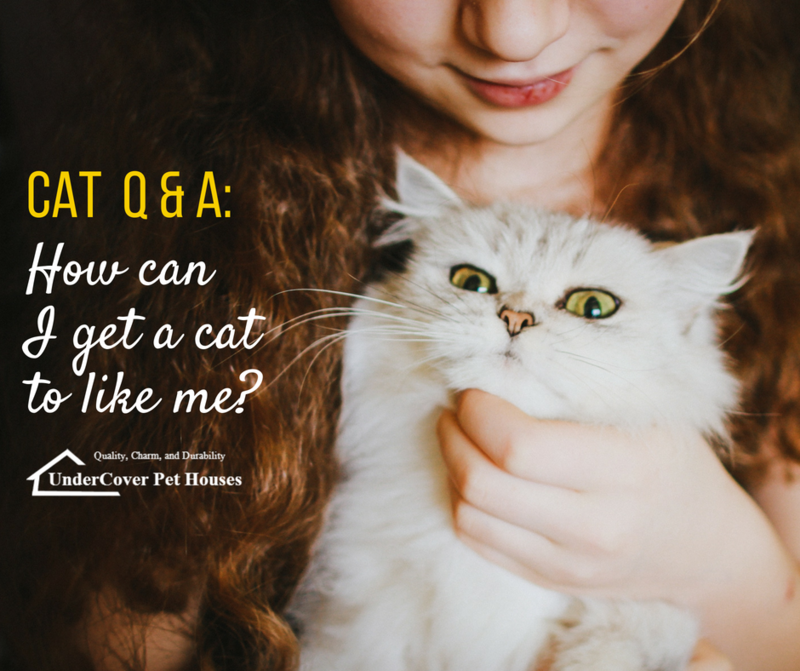 Cat Q & A: How Can I Get a Cat to Like Me?